I do not like crossing talk of track driving with that of road driving, because the techniques and the method of how you drive the car for each environment are totally different and should never be confused with one another. That's why this article is separated in two parts. Part two is about advanced braking technique. Braking is something that nearly every driver will take for granted. You are driving along a road and you come across a situation that requires you to lose speed, you put your foot on the pedal to apply your brakes and you slow down, but the question is, are you doing this in safe and proper way? First, let's try to explain how they work. Brakes are designed to slow down your vehicle but probably not by the means that you think. The common misconception is that brakes squeeze against a drum or disc, and the pressure of the squeezing action is what slows you down. This is only part of the reason you slow down. 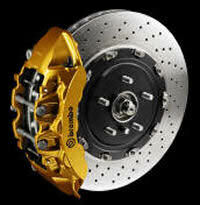 Brakes are essentially a mechanism to change energy types. When you're travelling at speed, your vehicle has kinetic energy. When you apply the brakes, the pads or shoes that press against the brake drum or rotor convert kinetic energy into thermal energy via friction. The cooling of the brakes dissipates the heat and the vehicle slows down. This is all to do with The First Law of Thermodynamics, sometimes known as the Law of Conservation of Energy. This states that energy cannot be created nor destroyed, it can only be converted from one form to another. In the case of brakes, it is converted from kinetic energy to thermal energy. Because of the configuration of the brake pads and rotor in a disc brake, the location and Angular force of the point of contact where the friction is generated also provides a mechanical moment to resist the turning motion of the rotor. There is a great deal of rubbish on the subject of brakes. There is a load of people who spent loads of money to have drilled discs, larger brake calipers and competition disc pads fitted to his vehicle, and they think that this made their car stop much more quickly as a result of the more powerful brakes, but are they right? Upgraded brakes WILL NOT improve tire grip. We know this because if we could make a car stop more quickly by spending more money on brake parts, we would save local authorities a fortune on winter road gritting, because our ability to stop would not then be dependant upon the quality or state of the road surface beneath our tires. It is true that we use brakes to reduce speed without stopping, but the stop is the ultimate end in braking effect and one that requires more work from the vehicle components, but to achieve the most desirable braking effect one has to cause the rotation of the wheels to be halted in a manner that is in harmony with the grip of the tires - so by the time the wheels are halted, the car has come to rest also. Often you can hear that the competition equipment they have fitted can run hotter than normal brakes and new drilled discs help dissipate the heat more quickly. That is rubbish again! Why do you need that level of equipment for road use? Why should you ever be in a position where you are getting your brakes to heat up to those temperatures? If you are, then I suggest you take a good long hard look at your driving style, because it isn't your brakes that want sorting out! It is true that some after market products have the ability to dissipate heat more efficiently, but we are talking here of the component parts coping with repeated and heavy applications, or to put it another way, coping with needless abuse. If you are looking at a competition environment such as a track event, then that is a whole different story. With repeated heavy applications at high speed the brake parts at the wheels will reach temperatures that standard equipment cannot cope with, which then justifies the requirement for different products to be used to overcome these extremes. That is why some competition brakes need to be heated up to a high temperature before they can begin to work effectively. Whilst they work very well on a track, they are not at all suited to the road, because in a road environment you are going to be hard pushed to get the brakes hot enough to work properly. If you abuse your brakes, and cause them to overheat, their efficiency will become diminished and you will get a condition that is commonly referred to as brake fade. In extreme cases the brake discs will turn blue in color. This discoloration being caused by excessive heat that irreversibly changes the molecular structure of the metal and the surface of the pads will become glazed. The result of this is they no longer work properly and the whole assembly has to be renewed. Something else you can get from overheating your brakes, and which causes brake failure, especially if you have not serviced and maintained them effectively. Brake fluid, like all liquids, has a boiling point, as does water. However, in the case of brake fluid that boiling point occurs at a much higher temperature than that of water, but if it does boil, it will naturally turn to vapor. If you know a thing or two about basic physics you will know that you cannot compress a fluid, which is why it is used in the brake lines of your car, as it effectively forms a solid, but flexible, connection between your master cylinder and braking components. However, if that fluid boils and is converted to vapor, and as we all know, vapor can be compressed, and when that happens to your brake fluid the displacement of fluid at the pedal end is disproportionately greater than what occurs at the brake caliper end. The temperature you have to generate to cause this to happen is very high, but if you do boil your brake fluid, and that is possible to do, your pedal will just plummet straight to the floor. The automotive industry spends millions of dollars on research and development to make sure that the car you buy is fitted with components that are appropriate for that vehicle and so the vehicle will perform within all safety and performance standards. That performance of the brakes, providing they are well maintained, will not produce any less braking efficiency than the after-market add-ons you can buy in the name of improving vehicle safety and performance. What the after market products do achieve is to make it easier to operate the brakes, which means having the capability to create the maximum degree of braking power at the wheels with less leg power being required from the driver at the pedal. However, the ability to reduce speed by braking is still limited by the maximum available grip of the tires in contact with the road. This is even the case with ABS, because ABS activates when the tire is about to lock-up into a linear skid. All modern cars and almost all obsolete ones as well, have brakes that are powerful enough to either lock wheels into a skid, or to activate the ABS from any speed throughout the vehicle's available speed range. The amount of time and distance it takes your car to stop from any given speed, providing your brakes are well maintained and are working at the required standard, is all down to the friction properties (coefficient of friction) that are present within the road surface upon which you are driving and the ability of your tires to grip on it. In reality, what people get with aftermarket fitted components is that that they are easier to operate, which created the illusion that they work more effectively. To better explain this, read a bit about forensic on the end of this article! If you do decide you must and need to fit what you believe to be better equipment, just ask yourself what exactly it is that you are compensating for? When you apply you brakes you will only be able to slow at a rate according to the amount of grip your tires have on the road, and tires get their grip on the road from something that is called downforce and tire compound. Downforce is present on a road car due to the mass of that vehicle acting downwards onto the road surface (this is a bit simplified statement, because normal car on some speed produce, depend on aerodynamic configuration, some small amount of downforce or upforce. But let's keep it simple). This is caused by gravity only. Therefore, if you have a car that weighs 1,000kgs, and if that weight is evenly distributed within that vehicle, you will have 250kgs of downforce at each of the four wheels to create friction between rubber and tarmac. On the racing car, you have to add downforce produced by aerodynamic forces, produced by car aero appendages or body itself. In some cases aero downforce can be more than double of car weight. When you apply your foot brake, and the car tries to lift its rear end off the road, it does not lose any of its 1,000kgs in total weight, as whatever comes off the rear axle has to go somewhere, and that somewhere will be the front of the vehicle. This is why cars and other road vehicles are fitted with bigger and more powerful brakes at the front, as compared to those at the rear. This process is called weight transfer. There will be many people that have traveled as a passenger in car, and wished they had remembered to travel with their surgical collars fitted so as to help prevent the jarring of their neck. You know the type of driver? The one that just pokes at the brake pedal separating your vertebrae every time they slow the car down or who will leave braking very late so that what should have been a gentle process of slowing now becomes an eye-popping stop experience. Apart from being very uncomfortable, and there being an enhanced risk of skidding or control loss, it is quite harmful for the car. Think about the stress it places upon the suspension linkages, the brake components and even the engine mountings. Yes, the engine mountings - and the gearbox too for that matter. Every time you snap the brakes on in a rough manner your engine and gearbox are trying to jump out through your radiator grille in just the same way as your shopping's jumps forward off the rear seat. There is a lot of stress going on here. If you want highest degree of control, braking should always be completed when traveling in a straight line before cornering and always be carried out progressively. Remember what we have said about weight transfer? Upon realizing the need to slow down or stop, firstly rest your foot on the pedal and then gradually increase the pressure until the desired amount of braking effect is achieved. Once your speed has been reduced sufficiently the procedure is then completed in reverse. You release the pressure on the pedal in the same progressive manner. In fact, braking should be tapered at both ends and fat in the middle, and it is amazing how by pondering upon that thought your braking technique suddenly becomes much smoother. It also should be commenced early to give time for it to be delivered smoothly and progressively, so as to provide the maximum degree of vehicle control. Braking during cornering will put the car off-balance. Under the effect of deceleration the front of the vehicle is more heavily loaded (weight transfer again), and because you are steering, that extra loading becomes unbalanced by acting of the centrifugal force on outer front corner of the car. This places a hell of a load onto that suspension unit and creates a great deal of extra work for that tire to have to cope with. When this happens, particularly with front wheel drive vehicles, the rear of the car becomes lighter, and with the dramatic unloading of the diagonally opposite wheel and suspension unit to that which has been unnaturally loaded. Lifting off the power in a front wheel drive vehicles is like applying brakes only to the front wheels. This braking effect being due to the retardation effect of the engine. This makes it more difficult for the back tires to grip the road, due to the reduced amount of downforce, and the back of the car can more easily become provoked into oversteer and start to overtaking the front. Applying the brakes whilst cornering can even cause the rear tire, the one traveling on the inside of the bend, to lose contact with the road altogether, as illustrated in this photo. The other product of braking into a bend is that the car will want to push straight ahead, instead of changing direction as you had intended it to, and so understeer can be induced. You don't get away with it in a rear wheel drive either. If you think about what is happening under you when you drive you will understand what this is all about. When we accelerate the engine is driving the driven wheels. When we decelerate the driven wheels are now driving the engine, unless we depress the clutch, in which case the drive chain between the engine and driven wheels is broken (please don't do that during the cornering). To put it another way, when you lift off the power the fuel supply is stopped from reaching the engine, but the engine doesn't stop running. It keeps going, because now the momentum of the car pushing along the road keeps the engine running at a rate that is consistent with the road speed of the car. This is producing a braking effect at the back wheels, and if we have a car that has a very torquey engine, the torque that gives us so much driving power and fun, now acts in reverse when decelerating, or on over-run as it is called. Lift your foot off the gas sharply, or if you select a low gear and then are rough with the clutch, you might just as well pull the handbrake on, because that is the effect you are having on the car. Oversteer is guaranteed. The usual way in which "normal "driver" deal with bends and corners is to decelerate, brake and change down through the gearbox all whilst steering around a bend, with all these actions usually being completed at the same time. Most will only reach appropriate road-speed for the bend, and have selected the appropriate gear, at the point when they are at the apex, halfway-round corner. 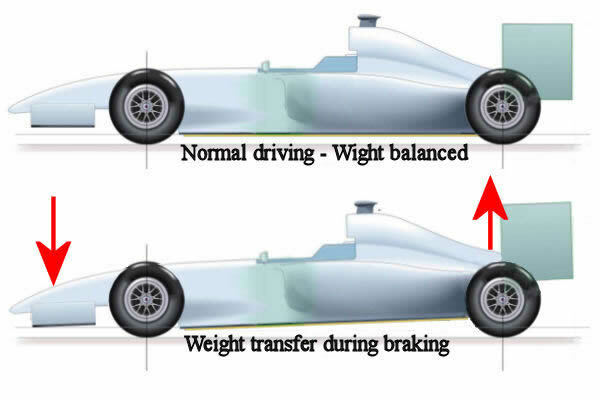 The effect of this is very uncomfortable for the car, because as soon as the foot is lifted from the gas, and/or the brakes are applied, the balance of the car changes so that the emphasis on downforce is biased towards the front, and if steering is applied as well this will create a greater potential for things to go wrong. Not only that, but it knocks the hell out of your tires too. Drivers who brake into corners will scrub the outer shoulders of their front tires away and won't get anywhere near the mileage they could out of them. They also accelerate the amount of wear and tear that occurs within the suspension components. The best method in relation to braking for corners is to first bring down the speed of the car until we are happy that it is appropriate for the corner or bend we are about to enter, and whilst still traveling in a straight line. Having settled the car to the speed required we now directly select the most suitable gear that will give us the necessary response relative to the speed at which we are traveling - again before we start to turn into the corner. Changing the gear can be done during the end of the braking phase too so that we are at the proper speed and proper gear in the same moment. By the time we turn into the corner we are traveling at the right speed and with the right gear. When we actually take the car around a corner/bend we are doing so under enough throttle applied to keep the engine pulling, but without the car accelerating, thus achieving the best-balance situation in terms of vehicle stability. When not causing you to spin, braking in corners not only scrubs the edges off the front tires and gives an uncomfortable ride, but it leaves nothing in reserve grip for you to use if things turn more ugly. There's so much more to braking than simply pressing the middle pedal. The very finest drivers are often distinguished by how little braking they do. And by the smoothness of their braking. The very best racing drivers have always produced noticeably less brake wear than their contemporaries. So skilful braking is very much a case of "less is more." After all, in racing you always want to go faster. Do you find yourself braking frequently or sharply? If so, it's probably your forward planning that needs attention rather than your braking technique. Do you try to minimize the imbalance of the car by braking smoothly and, as far as possible, in a straight line? Notice whether you brake just once before any hazard or whether you take a second or third stab at the brake pedal. Intermittent braking makes the car pitch unnecessarily which upsets its balance and grip, so try to do all your braking in one go. Notice whether the bulk of your braking on the approach to a hazard is done with a constant pressure or whether you brake harder towards the end of the approach? Many drivers misjudge how much braking pressure they need to slow down in the distance they've allowed. Consequently they brake too lightly at first, and then realize they're running out of space and have to brake harder. If you find this happening to you, practice braking a little harder than seems appropriate initially until you can brake consistently with a constant pressure. How does it feel when the car stops? Any jerk? It's possible to stop very rapidly without any jerkiness - by applying and releasing brake pedal pressure progressively. By "feathering" the pressure right off just before you stop, all the extra weight that was shifted forwards under braking is gradually removed from the front springs and the car rolls smoothly to a standstill. If you feel your stops could be smoother, aim to finish braking a little short of your stopping position and roll up to it. Often drivers who are capable of feathering the brakes in order to make jerk-free stops fail to use the same technique when finishing braking on the move, after adjusting speed to approaching hazard. Notice how smoothly you taper off the brakes before corners and other hazards. Does the nose of the car rise gently or does it bounce up abruptly as the front suspension "unloads"? Notice whether passengers' heads move backwards as you release the brake pedal. If your release of the brakes seems a little abrupt, are you allowing enough room on the approach to ease off the brakes gradually or are you holding the brakes on firmly until you're almost at the hazard? OK, let's talk about ABS! What does ABS do? ABS senses when a wheel is about to lock up under braking, and when it does sense that moment, it releases braking effect at the particular wheel that is having difficulty. Once that has happened it then re-applies the brake many times per second. So, if we are trying to stop as quickly as possible, why are we releasing the brakes? A revolving tire in contact with the road surface will give maximum braking efficiency at the point where it is on that knife-edge stage where it is about to lock up, but is still revolving. A skilled driver will be able to sense when and where this point will occur and be able to hold his or her foot in such a position on the pedal so as to maintain that point without locking the wheels. This will allow the car to stop in a shorter distance than if the vehicle was fitted with ABS, and where that ABS is being activated. However, we are talking very small measurements here and this will only be possible in an environment with a near perfect road surface. What ABS does that a non-ABS car cannot do is to manage the braking effect on each wheel independently, whereas if we are driving a non-ABS equipped vehicle we would have to have the same friction properties at each wheel. What generally happens with a non-ABS equipped vehicle is that the driver, faced with an emergency, will clap his or her foot straight on the pedal and lock the front wheels into a skid. Once the front wheels are locked you can spin the steering wheel from lock to lock, but the car will go nowhere else but straight on. Locked tires cannot steer because all the available friction is used up slowing the vehicle down, leaving none for any sideways force used to change direction. The only things that will cause the car to deviate from the straight-ahead path are where there is a camber or cross-fall on the road, or if it collides with something else. In the case of a cross-fall or road camber the car will gently veer off-course and downhill, whereas collisions will cause it to deviate more suddenly through the act of deflection. That's one way police can determine the location of the point of impact, this being where the black tire marks, after running fairly straight, suddenly deviate off-course to one side or the other. If the driver of a car in a front wheel lock-up situation were to release the brakes, the ability to steer the car would be restored and often whatever it is that is about to be struck, could possibly be avoided. That is why ABS does not allow the wheels to lock, as it retains the ability to steer. ABS was introduced, primarily, to cover up for a lack of driver skills, and this was necessary as almost every driver, when faced with an emergency that required both urgent loss of speed and change in direction, would crash into whatever it was they were trying to avoid. This is because the instinctive reaction for nearly all of us will always be to try and press the foot through the floor whilst vainly heaving on the steering wheel with all their might to avoid impact. With ABS, however, there is no locking of wheels and therefore some directional control is still available. So, the primary benefit of ABS, for normal road surfaces, is to increase the ability of the driver to maintain control of the vehicle, rather than go into a skid. Despite this, loss of control still remains likely on loose surfaces, like gravel, or slippery surfaces like snow or ice. On a very slippery surface, such as sheet ice, poor wet road surface, it is possible to lock multiple wheels at once, and this can defeat ABS, which relies on detecting individual wheels locking. When activated, the ABS causes the brake pedal to pulse or vibrate, which is very noticeable, as it causes the partial release and reapplication of braking effect at the wheel many times per second. As most drivers rarely or never brake hard enough to cause the system to activate, and a significant number rarely bother to read the manual of the vehicle they drive, the effects may not be discovered until a real emergency is encountered. This usually when they encounter the pulsing of the pedal for the first time. Many will react by reducing pedal pressure and thus lengthening braking distances, contributing to a higher level of road collisions than the stopping capabilities of ABS would otherwise promise. In short, many drivers first time experience of the rumbling pedal is quite alarming. The recommended technique for non-expert drivers, when in a typical full-braking emergency and using an Anti lock Braking System, is to apply maximum brake pedal pressure and maintain it, whilst steering to avoid collision as necessary. This is the one for all solution to most situations, but to do this effectively training will be required. Don't wait for a real emergency before you experience the sensation through the pedal, but try it out in controlled circumstances first, and then come the time you have to use it, the sensation won't come as such a shock. Perhaps in an empty car park, on a quiet country lane, on some private land, but only do it at very low speed, and when there is no one else around to be caused alarm. Driving on high-traction surfaces, such as tarmac or concrete, whether wet or dry, a non ABS-equipped car, depending upon who is the driver, will be able to attain braking distances better (i.e. shorter) than those that would be easily possible with the ABS. An alert and skilled driver without ABS should be able, through the use of techniques like threshold braking, to match or improve on the performance of a typical driver with an ABS-equipped vehicle, but for a majority of drivers, in most conditions and in typical states of alertness, ABS should at least reduce their chances of a pile up, or reduce the severity of impact if nothing else. Vehicles equipped with braking systems without ABS have been shown to out brake vehicles equipped with ABS, and the British car magazines Evo and Autocar both conduct periodic tests of vehicles comparing their ability to accelerate from a standing start to 100mph, and then brake to a stop. This is the so-called 0-100-0 test. They repeatedly find that the cars without ABS will outperform comparable cars equipped with ABS. On gravel and in deep snow, ABS tends to increase braking distances, not reduce them, but why? On these surfaces, locked wheels dig into the gravel or snow, building up a wedge of material ahead of the tire, which helps to slow the vehicle more quickly. ABS prevents this from occurring. Some ABS calibrations reduce this problem by slowing the cycling time, thus letting the wheels repeatedly briefly lock and unlock, which is better, but not ideal. Some manufacturers have therefore implemented something called Brake Assist systems that determine if the driver is attempting a panic stop and will maintain braking force in this situation. Nevertheless, ABS can significantly improve safety and control for drivers in on-road situations if they know not to release the brakes when they feel the pulsing pedal. The biggest advantage that ABS has over a non-anti locking system is the modern ABS systems will compensate for each of the four tires being on four different surfaces. In this scenario the system will monitor and apply different degrees of braking pressure to each wheel according to the level of tire adhesion available. This is something a human controlled non-anti lock system can't achieve, as with the non-ABS vehicle, the maximum overall braking effect will always be limited by the one tire out of four that is experiencing the highest level of grip. So there you have it. ABS is great for many situations, but not the answer to all. And, to get the best from it you need some training. Otherwise it just remains a Marketing Point in a glossy sales brochure. And for the end, little bit of forensic science! Once your wheels have locked up into a skid it does not matter what vehicle you are in, as that vehicle will slide for exactly the same distance as another that is braking from that same speed and on the same bit of road. You are driving a good quality modern saloon car, but with the ABS disabled, along a motorway at 110 kmh in lane two. Next to you, in lane one, there is an old Morris Minor, traveling at exactly the same speed. An unexpected incident occurs and the drivers of the two cars stamp on their respective brake pedals at the same time and lock the wheels of both cars into a skid, this occurring at exactly the same moment in time, and from exactly the same point along the road. Now here is the bit that causes controversy. Both cars WILL skid from point of lock-up to the point where they stop over the same amount of distance as each other! Different types of vehicles, once sliding with locked wheels, will take the same distance to stop from the same speed on the same bit of road surface, even though they may weigh 1-tonne or 20 tones, or have twelve-inch wide tires, six-inch wide tires, four tires or eight tires - but the comparison has to be made under identical conditions. Put the Mini Moris and a truck next to each other in the same test and the result will be much the same, the only difference being that as the truck tires are made of a more synthetic compound, so as to prolong mileage life, as a compromise the commercial tires do not provide quite as much grip. However, the difference is very small. The heavier the vehicle the more momentum it has, but the heavier the vehicle the greater the downforce there is transmitted through the tires to the road, and the more downforce there is the greater the grip of the tires on the road and giving a better braking effect. With the bigger vehicle the extra weight that is pushing down on the road is also pushing forward by an extra amount, and the result is the two cancel each other out. Put extra wheels and tires on the vehicle to make more surface area of rubber touch the ground and you find the weight is then spread over a larger area and so becomes less at any given pin-point spot. This cancels out any advantage that you think you would have achieved with having that extra rubber. Take a 28-tonne 4-wheeled vehicle and a 28-tonne solid block of tire rubber and each will slide for the same distance from the same speed on the same coefficient of friction road surface. If this were not the case accident investigators, when dealing with a collision, involving a heavy goods vehicle, they would have to perform their reconstruction skid-tests by using a lorry of the same type, but they don't. They use a police saloon car because the two different vehicle types make no real difference. In the course of investigating serious Road Traffic collisions great lengths are taken to determine what took place. Much of the evidence is obtained from marks that have been left on the road surface by the vehicles or other objects involved. Tire marks provide a wealth of information, whether these are striation marks (the arc-shaped ones from critical speed cornering) or those left on the road when the car has locked up its wheels under braking, which are those being talked about here. In order to use the information these marks provide police investigators have to make some of their own skid marks to use them as a benchmark. A simple way in which to do this is to take a patrol car, turn off the ABS and create reference marks by driving at known speed and stumping the brake. Skid marks are made and length is measured. By using this method the speed at which the car test car was traveling at when it made the skid marks is a known quality, as is the distance it took the car to stop from that speed when making those marks. From this information, and by working the formulae into the accident skid marks, the speed at which the accident vehicle was traveling at the point where it started to slide can be accurately worked out. Before anyone picks up on a point here, this method does not tell you how much speed was lost prior to wheel lock-up, but that is not what we are talking about. Once all the data has been gathered, and the calculations made, the whole package is sent away to a forensic scientist for verification. That method is widely used in the investigation of road collisions over the world and is a proven method of calculating the speed of a vehicle beyond all reasonable doubt by use of the skid marks left at the scene, and the formula that is used is always the same. The point of telling you this is to say that because different sized vehicles, when skidding, will slide for the same distance as each other, it doesn't matter that the test vehicle is a different make and model. Strange but true. Now that we have covered this subject to this depth, ask yourself if you think there would there be anything to gain by fitting more powerful brakes to your car? The answer to that one is yes there would be an advantage, because fitting bigger brakes will make them a little more comfortable to use as less effort will be required to obtain full braking power. However, if the purpose of the alteration is to make the car stop more quickly, or to put it another way, to stop over a shorter distance, then the answer to the above is no, because bigger brakes don't stop you more quickly, they are just lighter to use.